Join us for Sunday Funday with brunch at Pair O Dice Brewing. Out of the Pot food truck serving Eggs Francisco, Strawberry Pancakes, and Huevos Rancheros with craft beer cooked right into the recipes. 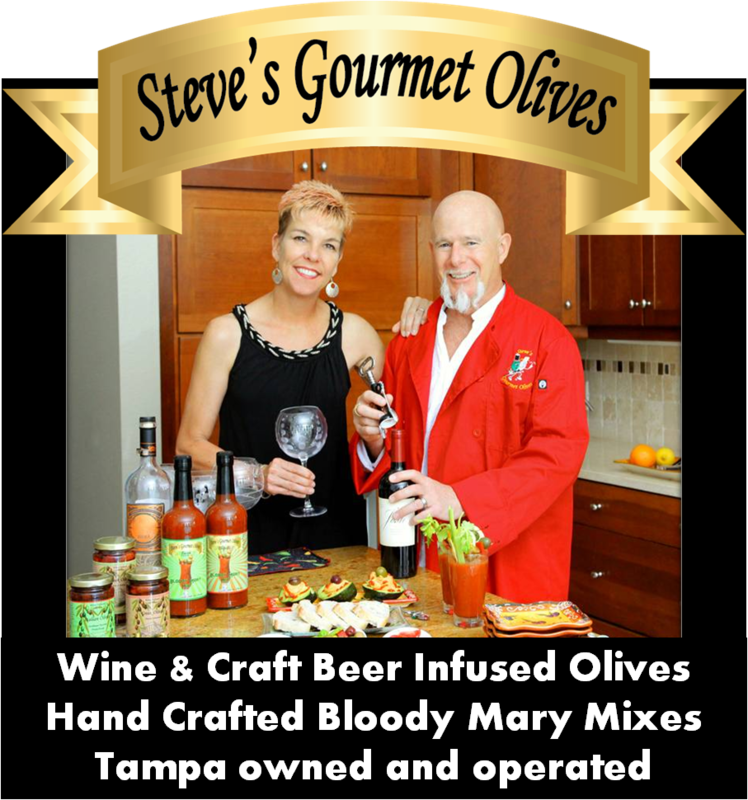 Steve's Gourmet Olives serving mild bacon & spicy chipotle Micheladas featuring Clearwater Honey Cream. $10 at the door gets you samples of 75+ fine wines, craft spirits and local food. Also a discount coupon towards purchase and a souvenir wine glass to take home. Bring a friend. "You Pick" blueberries, live music, food trucks, 100+ local vendors, kids play area, and delicious local wine & craft beer. Friday 8 am - 11 pm, Saturday 8 am - 11 pm, Sunday 10 am - 7 pm. FREE ADMISSION. .
NEW THIS YEAR. Keel & Curley has their own food truck now. They will be serving food full time during tasting room hours. Look for Steve's Gourmet Olives featuring Two Henrys Brewing Roasted Jalapeno Blueberry Porter on the menu. Jars for sale in the tasting room soon, too. Monday Night Moonlight Market is a FUNky new market in Seminole Heights the last Monday of each month 7 pm - midnight. Featuring unique and eclectic artists, performers and vendors you won't find anywhere else. Located beside Red Star Rock Bar in the heart of Seminole Heights. Check out the video on Vagabond Gita Facebook page. This is the sister event with the same market managers.